The Ear Band-It ® Putty Buddies Earplugs really do float! These colourful, soft silicone plugs are larger than most other child-sized silicone plugs to completely fill the outer ear, providing a watertight seal over the ear canal. With an estimated 20-22 db noise reduction, the soft silicone lets your child hear through the plug well enough that you can get your child's attention if you need to. The system using an Ear Band It ® Headband with Putty Buddies Ear Plugs was originally designed by an ear, nose and throat specialist to prevents ear infection for his young patients with ear tubes to help keep the Putty Buddies plugs secure, even during vigorous activity. Recommended by physicians for prevention of swimmer's ear or for children with ear tubes. Softer silicone for a more comfortable fit. Tacky texture to allow plugs to remain in position better. Bright colours - appealing to kids, and easy to find in the pool or bath. Pack of 3 different colours. Worlds only moldable floating silicone ear plugs for swimming and bathing. Make sure the user's ear is clean, dry and free from wax/oils prior to placing the ear plugs over the ear canal. Flatten the plug into a disk, place over the ear canal and pressed gently on the plug in a direction outward from the ear canal to "lock" the silicone into the outer cartilage of the ear. Once removed, store the ear plugs in the plastic container (covered)until further use. The Putty Buddies ear plugs should be discarded once they become dirty in appearance or if they appear to be cracked or coming apart. This should be 1-2 weeks with daily use if handled with clean dry hands. Does exactly what it says. No ear problems since using them. Hi I would really recommend this product. It is easy to use and comfortable to wear. It does what it says on the tin! These are the best ear protectors for children who need to keep their ears dry when swimming or washing hair. I have chronic ear drum perforation and must not get water in my ears Putty Buddies are essential if I want to swim or white water kayak. They do not fail if you follow the instructions! We were very pleased with this product. We found them easy to insert and would recommend. Come in different colours. Very happy with the quality of the items, packaging and speed of delivery. I am more than happy to recommend Newitts. Because of this, I have had no discomfort whatsoever since using these ear plugs. The plugs seem to have a tacky feel to them, actually sticking to the skin in the ear cavity, rather than just moulding to your ear shape (which can often allow water to seep in over long distances (and long periods in the water). 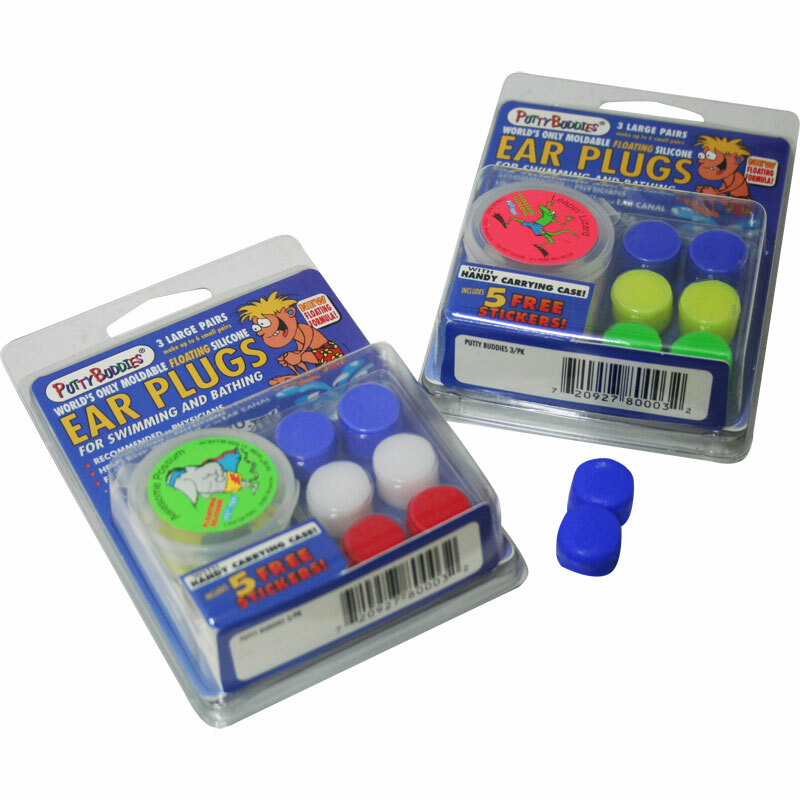 My six year old daughter also suffers from ear problems, so I use these on her too, and they are great. I bought these for my 11 year old daughter. She has recently had a number of ear infections and the doctor told her not to get her ears wet. These are perfect - much better than the traditional ear plugs that just pop out when wet. They mould to the ear and she can put them in and out herself. The little case is handy too. We have used putty buddies before but the non-floating type and have always been pleased. These however just get stuck to the headband and pieces of silicone come away constantly. They are brilliant, my son has perforated ear drums and cannot get any water in his ears. He uses these ear plugs with a swimming hat. He has been swimming for a couple of years now with no problems. 3 out of 5 Very sticky - but they do work! These work fine with the ear band in place. But I didn't realise how sticky they become, so be careful not to get them anywhere near your child's hair. We've had a few sessions cutting silcone out of my son's hair! It's a draw back we'll live with now we're aware of it. A fab product at unbeatable price. Quick delivery. Perfect product for a child with grommets. I would highly recommend this product and Newitts.